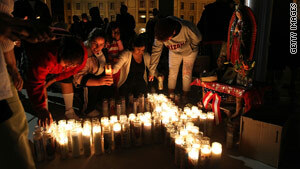 Protesters light candles outside the Arizona Capitol on Thursday night to protest the new illegal immigration law. Brewer: Amendments make clear "that racial profiling ... will not be tolerated"
(CNN) -- Arizona Gov. Jan Brewer signed a bill Friday that makes changes to a controversial new state immigration law, saying the changes should ease concerns about racial profiling. "These changes specifically answer legal questions raised by some who expressed fears that the original law would somehow allow or lead to racial profiling," Brewer said in a statement after the signing. "These new amendments make it crystal clear and undeniable that racial profiling is illegal and will not be tolerated in Arizona." But opponents challenged that assertion in the run-up to Brewer's signing of the changes into law on Friday. "It doesn't deter anything," said Dan Pochoda, legal director of the Arizona ACLU. "It's not a serious hurdle." Pochoda said that law enforcement officers -- under strong pressure to find and remove illegal immigrants -- could still identify people by race and then look for a minor infraction as an excuse to investigate them. He noted that the authors of the immigration law, passed April 23, also backed the changes to it. The new Arizona law requires immigrants to carry their alien registration documents at all times and requires police to question people if there is reason to suspect they are in the United States illegally. Video: Will immigration debate cost Democrats? Under the law, police would be able to detain an individual based merely on the suspicion that he or she entered the country illegally. But one of the changes -- which had been adopted by state lawmakers Thursday night -- says police could stop suspected illegal immigrants only while enforcing some other law or ordinance. An officer could only ask about an immigrant's legal status, for example, while investigating that person for speeding, loitering or some other offense. The new law also makes it a state crime to live in or travel through Arizona illegally. And it targets those who hire illegal immigrant day laborers or knowingly transport them. University of Arizona law professor Gabriel Chin told CNN that the changes to the bill are significant, insofar as they help remove a "huge disincentive for victims and witnesses to cooperate with the police." Under the original version of the law, he said, police officers would have been obligated to arrest a suspected illegal immigrant who approached them after being victimized. That would not be the case under the revised law. Arizona's law originally said that the attorney general or a county attorney cannot investigate complaints based "solely" on factors such as a person's race, color or national origin. The changes enacted Friday remove the word "solely" to emphasize that prosecutors must have some reason other than an individual's race or national origin to investigate. But Chin dismissed the significance of that change. Both the federal and state constitutions make it clear that you can "never stop someone exclusively on account of race," he said. Racial profiling would still occur, he said. "It's always 'race plus' in these situations. ... The law still allows the consideration of race as a factor." Defenders of the law -- angry over the charges of racism permeating the debate -- say it is needed because the federal government has failed to enforce border security with Mexico, allowing hundreds of thousands of illegal immigrants to move into in the state. "Illegal is illegal," Arizona state Sen. Russell Pearce, the controversial statute's primary sponsor, told CNN Friday. "Illegal's not a race, it's a crime. ... And in Arizona, we're going to enforce" the law. Pearce accused President Barack Obama, a critic of the measure, of "aiding and abetting criminal activity, inciting criminal activity, inciting violence, and [violating his] oath of office to secure this border, enforce these laws and defend the American people." Some analysts said that Arizona was compelled to adopt the amendments in reaction to a growing movement among civil rights activists and others to launch an economic boycott of the state. On Friday, two San Francisco, California, officials wrote a three-page letter to Major League Baseball Commissioner Bud Selig to ask that the 2011 All-Star Game be moved from Phoenix, Arizona, if the law is not repealed. The overall law has drawn sharp scrutiny from the Justice Department, at least two lawsuits and condemnation from the Mexican government and other Latin American nations. Several prominent entertainers also have spoken out against the measure. An April 27-28 nationwide Gallup poll, however, found that 51 percent of Americans favor the Arizona law, while only 39 percent oppose it. The changes to the law are not sufficient and will do little to positively affect daily law enforcement in Arizona, argued Clarissa Martinez De Castro of the National Council of La Raza, a major Latino civil rights organization. "Even right now, without this law, we know that the practice on the streets is different," she told CNN. "The [current] practice doesn't reflect what the law is. And if the governor is saying that racial profiling is not going to be tolerated, why has it been tolerated so far?" About 500,000 unauthorized immigrants were believed to live in Arizona in 2008, and 11.9 million nationwide, up from 3.5 million nationwide in 1990, according to a Pew Hispanic Center report published in 2009. Protests against the Arizona law are scheduled Saturday in at least 21 states, the District of Columbia and two Canadian provinces. In all, protests are planned for 47 cities. The changes to the law will take effect along with the rest of the statute in 90 days. "It goes back to the federal government," Martinez told CNN. "If they abdicate their responsibility, they leave state and local governments to grapple with this issue, and the only thing that happens is that we create greater chaos. ... This is just not the way forward."